Our post-launch plan for Words With Friends 2 was just as ambitious as the launch itself. We had a long list of features in our backlog and a clear objective but as we began to put these features in front of users one question kept coming up; Why? Why do I care? Why would I do that? Some of our users have been playing the same game for 9+ years. They don’t want anything else. Or so they said, over and over again. Despite the direct feedback their behavior was starting to change. We saw in the data that their powerup consumption and engagement with the coin economy was increasing. We knew we could already influence behavior by rewarding users powerups, coins and even cosmetic rewards like badges. It became clear to us that for these new features to succeed we would need to introduce more ways to reward our users. This led us to pursue an old idea, but one of the boldest in Words With Friends history: Tile Styles. This may sound like hyperbole but I have been part of two redesigns of the product and we barely touched the styling of the tiles in both of those. The gameboard was sacred and we were about to make a big change. Here are the goals we were trying to accomplish by taking that risk. To increase engagement in systems that reward Tile Styles. To appeal to a large portion of our audience. Prove user interest in cosmetic rewards, items of expression , and representation of status. The leads began brainstorming reward vectors of all types. Cosmetic items, gameplay enhancements and bonuses. Anything that we thought would resonate with our users. The list included gameboard themes, themed tiles, a few new powerups, Weekly Challenge bonus points, and many more. We decided to put some of these features in front of users and see what they thought. Tile Styles topped the list for both cosmetic and gameplay enhancements. We pursued the feature but since it was such a big change for users we needed to prove it was worth it. Below are some of the methods we used to test these rewards with our users and to get conviction in Tile Styles. From the start we asked for user feedback on Tile Styles and optimized based on that feedback throughout development. A maxdiff survey that weighs potential features against each other. In-game click tests. To gauge interest from active users. 3x Consumer Insights interviews with Prototypes. 2x General surveys on potential art and general user interest. Soft launch to test and optimize. Tile Styles tested well consistently. It also satisfied one of the main goals for our users. Which was to provide a variety of ways in which we could reward users. Scrabble purists don’t want to use powerups because they view them as cheating so maybe cosmetic rewards would be more appealing. Once the positive survey results started to roll in we began development on the feature and I led the creation of the feature criteria/design pillars and spec from the UX side. 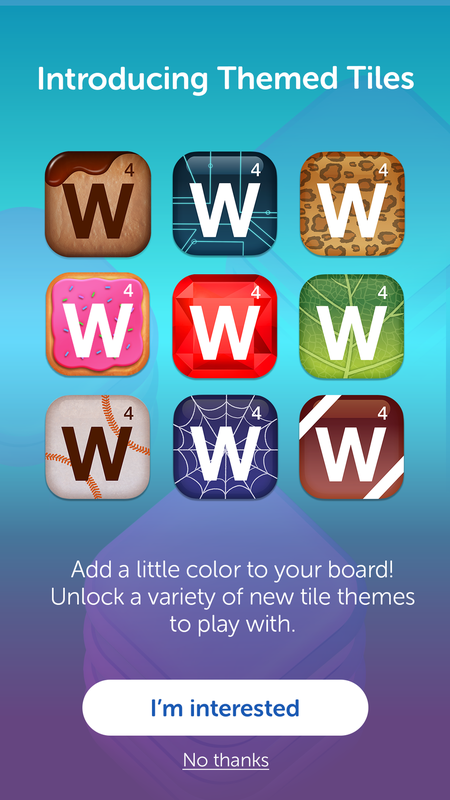 Users are driven to earn Tile Styles and “collect them all”. Tile Styles gives everyone a way to express themselves and something to work towards. Players look forward to finding out which Tile Styles are in the next release and which are next for them. We needed a reward for multiple other systems so we wanted to spread the Tile Styles love out. We didn’t want to give out a whole Tile Style for a single action. It seemed as if a collection-like mechanic would best solve that problem. There were a lot of ways we could execute the solution and there were a lot of stakeholders. We had a lot of pressure from executives to create an alphabet collection where users would collect each letters to earn the ability to use the Tile Style. It sounded good in theory but the experience was confusing, and it limited our ability to reward users frequently, over a long period of time. In finding a overall narrative and visual language to translate progress we came up with many ideas that were ultimate rejected. We wanted to lean into an existing experience which is why we inevitably went with the progress bar used in the Weekly Challenge and Events features. After countless iterations and Consumer Insights interviews, where we presented Flinto prototypes, we decided on Paint as the unit of measurement that the players would collect. Paint worked the best because it reemphasized the fact that these Tiles were only cosmetic. Below is an example of the alphabet version but there were many other concepts and explorations, like pieces of the object (eg shards of ruby) and a standard building block material. One exploration of the collection mechanic where users collected the letters in the alphabet. Players earn Tile Styles Paint from Mystery Boxes earned by engaging with various Words With Friends features. When the player collects all the paint for a Tile Style, they unlock the ability to use it against their friends. Players each control their own Tile Styles and can see each other’s Styles in-game and on the gameslist. 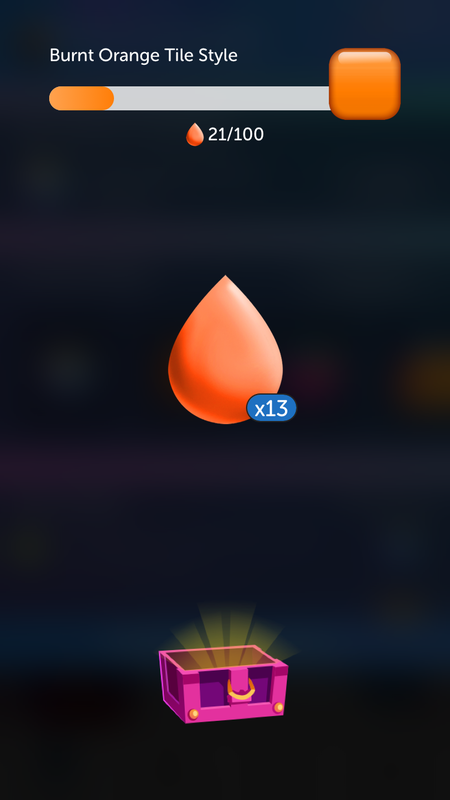 Once they collect x paint drops they can use the Tile Style on the gameboard. Users can change their Tile Style from the gameboard or inventory screen. Seasonal Premium Tiles are available for sale in the store. The impact of this feature on the gameslist and the gameboard is huge. Suddenly our game is alive with color. It also had the added bonus of allowing players to tell which player played which tile. 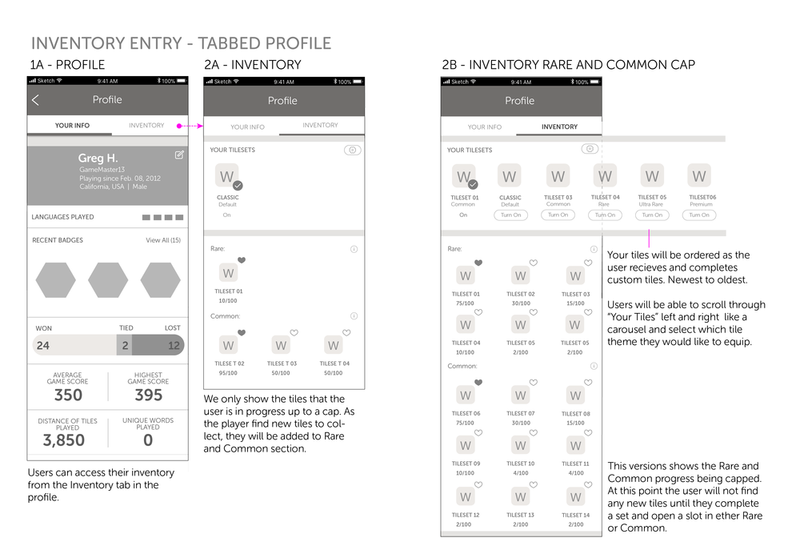 Below are some wireframes and a description of the general flows and functionality. 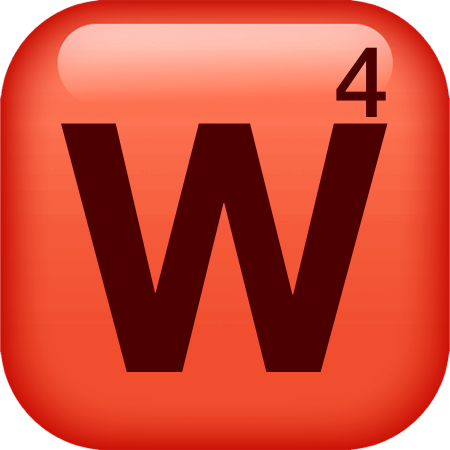 Tile Styles set a new standard for adoption rates in Words With Friends. It double our expectations. For our launch event we paired with the Susan G. Koman Foundation to create a Breast Cancer Awareness Event that raised 100k. It was an all-around effort between the studio and partner teams (Marketing, Consumer Insights, etc) and it was a smashing success. Tile Styles was the most collaborative feature with Consumer Insights and Marketing that I’ve ever worked on and a lot of the success came from those relationships. We are now executing towards v2 and our ultimate vision for the feature. Below are some high level results. Drove product strategy and vision for v1 and beyond. Responsible for presenting and explaining strategy to executives and other stakeholders. Art direction and managing vendor pipeline to create Tile Style Art.